Boeing announced Tuesday a significant investment in Reno, Nev.-based Aerion, which is developing an advanced supersonic business jet. The 12-passenger AS2 will fly over oceans at speeds up to Mach 1.4 or approximately 1,000 miles per hour, and is slated for first flight in 2023. Boeing announced Tuesday it’s making a “significant investment” in a startup company developing an advanced supersonic business jet. 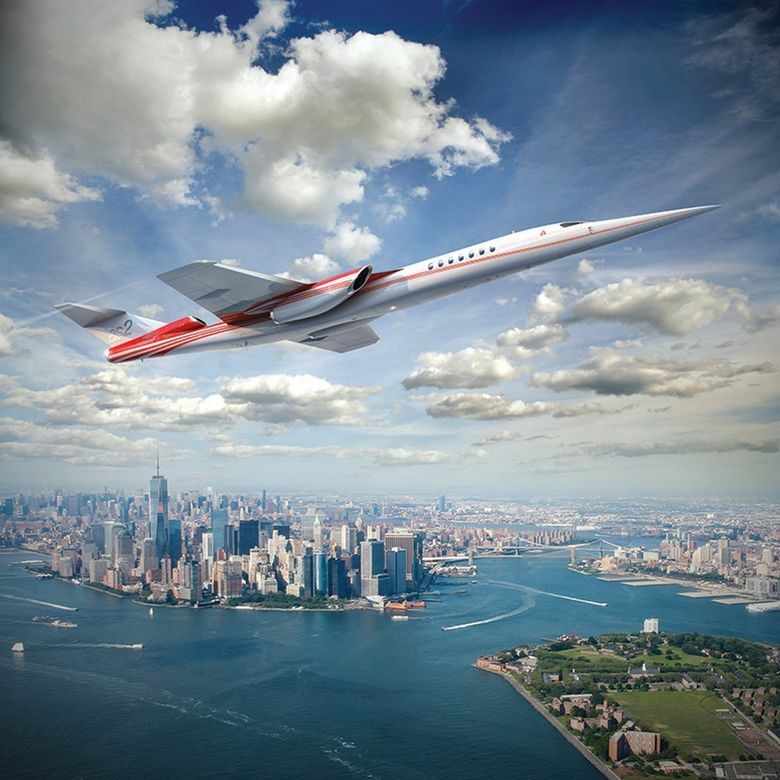 The deal with Reno, Nev.-based Aerion should accelerate technology development and design of Aerion’s planned AS2 supersonic business jet, a sleek, needle-pointed design concept that resembles a small version of the Anglo-French supersonic Concorde. Boeing said it will provide engineering, manufacturing and flight-test resources, as well as some parts of the aircraft, to help bring the AS2 to market. Two Boeing rivals, first Airbus and then Lockheed Martin, had earlier partnered with Aerion, though each eventually dropped out. The 12-passenger AS2 will be built mostly from carbon fiber composite and is designed to fly over ocean routes at speeds up to Mach 1.4, or approximately 1,000 miles per hour. Over land, the AS2 is intended to cruise at Mach 0.95, to avoid sonic booms that would breach noise regulations. Flying up to 70 percent faster than today’s business jets, the AS2 could save approximately three hours on a transatlantic flight. The aircraft is slated for first flight in 2023. Aerion believes that later versions of the aircraft will include technology to allow it to cruise supersonically at speeds approaching Mach 1.2 without a sonic boom. Development of such technology could be key to the business case for the aircraft. The 1973 ban on overland supersonic flights in the U.S., due to concerns about the impact of sonic booms, severely limited the market for the Concorde. Terms of the deal were not disclosed. However, Boeing will fill two of Aerion’s five board of director seats, suggesting it has taken a significant equity stake. Joining the board are Mike Sinnett, Vice President, Product Strategy and Future Airplane Development at Boeing Commercial Airplanes, and Ken Shaw, Vice President, Supply Chain at Boeing Global Services. Last June, Boeing revealed research into a small Mach 5 hypersonic airliner, though it conceded that is 20 to 30 years away from becoming a reality. Other startups are also pursuing supersonic flight. Boom of Denver, Colo., is developing a 55-seat Mach 2.2 airliner, and plans to fly a two-seat concept demonstrator — “Baby Boom” — this year. The sudden interest in supersonic designs comes 15 years after Concorde was grounded. That plane, though a technical marvel and a beautiful shape, never made money; only 20 were built and only 14 were ever sold commercially. In this month’s edition of AirFinance Journal, aviation expert Adam Pilarski of consulting firm Avitas predicted that air passenger traffic will move towards supersonic aircraft, at first in smaller aircraft “with only one (very expensive) class” then later on supersonic aircraft with different classes of service. “The world’s wealth is rising constantly and a larger part of the population will be able to afford faster, though more expensive, travel,” Pilarski wrote. Aerion unveiled the AS2 business jet design in 2014 and last year announced the selection of GE’s Affinity engine to power the aircraft and of Honeywell to design the cockpit. The Boeing deal is the latest in Aerion’s changing carousel of big aerospace partnerships. In making its investment, Boeing has supplanted Lockheed Martin, which in December 2017 announced a memorandum of understanding with Aerion “to explore the feasibility of joint development” of the AS2. Aerion spokesman Jeff Miller said the new agreement with Boeing supersedes that MOU. A Lockheed spokesperson said its contract expired on Friday, just days ahead of Boeing’s announcement. Before Lockheed, Aerion had an engineering support contract with Airbus, but that ended in 2017.